Until June 23, the Fondation Azzedine Alaïa will stage Adrian and Alaïa: The Art of Tailoring. Both men had much in common – including a professional connection to Greta Garbo – Alaïa, mesmerised by Adrian since childhood, would eventually collect over 150 pieces of Adrian’s work during his lifetime. The exhibition, the first time Adrian’s work has been displayed in France, will highlight the similarities between the designers, notably their sharp tailoring and film work. In his lifetime, though, Adrian too found influence from a designer who had come before him: the Surrealist couturier Elsa Schiaparelli. 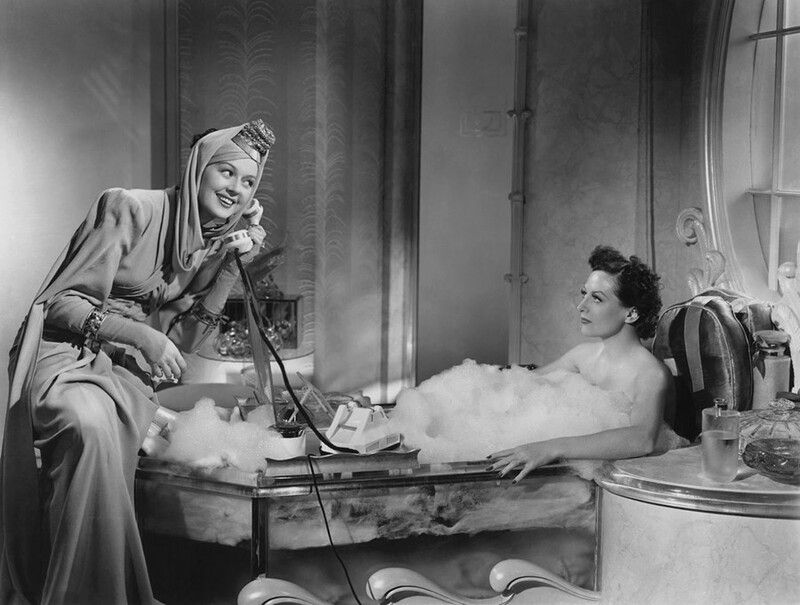 In 1939, George Cukor’s The Women, based on the play of the same name, was released in cinemas. 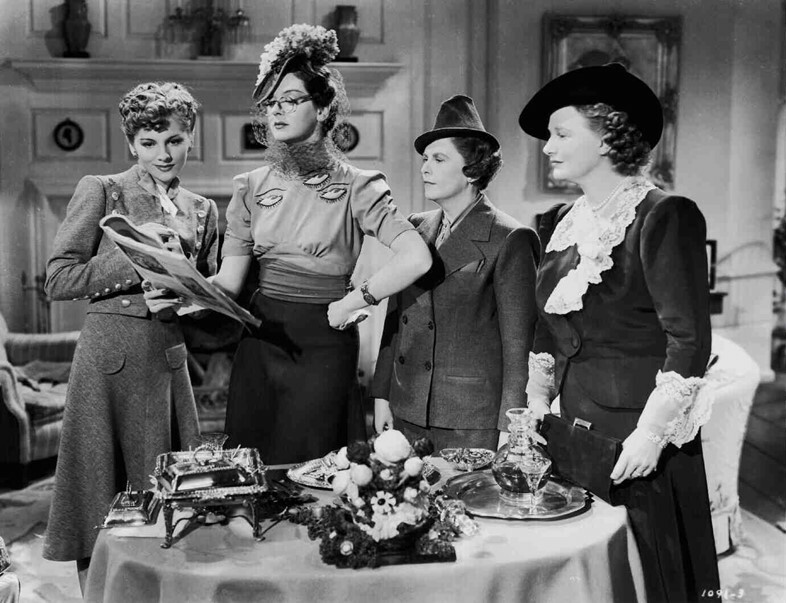 Norma Shearer, Joan Crawford and Rosalind Russell headlined the all-female cast, which also starred Paulette Godard and Joan Fontaine to name two more, in a film that attracts as much for its wise-cracking, whip-smart dialogue as for the fashion on display. Those costumes, designed by Adrian, found influence in Schiaparelli’s era-defining designs. By 1939 Schiaparelli had already established herself as an innovative designer with a flair for unconventionality. As pioneer of the wrap dress and one of the first to incorporate invisible fastenings in her creations, she took practical, functional clothing for women and injected it with the spectacular. Schiaparelli’s collaborations with Salvador Dalí, Jean Cocteau, Leonor Fini, Meret Oppenheim and other members of the Surrealist group may have brought her notoriety and acclaim, yet she was no stranger to the movie world. Following Schiaparelli’s first visit to Hollywood in 1933, that December’s issue of Motion Picture magazine described her as “the most copied couturier in Paris”. Her Paris Atelier became a rotating door of Hollywood actresses. Clara Bow was one of her first private clients, and others included Greta Garbo, Myrna Loy and Katharine Hepburn, and soon the shoulder padded garments she designed for Joan Crawford’s personal wardrobe were being adapted and incorporated by Adrian for Crawford’s on-screen outfits. Yet her on-screen work was more downplayed. Although widely known for Mae West’s gowns on Everyday’s A Holliday (1937), her designs for Zsa Zsa Gabor on Moulin Rouge (1952) went largely undetected. As a result, when the movie won that year’s Academy Award for Costume Design, the trophy went to Marcel Vertès’ ensemble pieces rather than Gabor’s specific wardrobe. Adrian, meanwhile, had an illustrious resume of movie work and created a sensation with his elaborate and theatrical gowns festooned with feathers. Raised in a hat shop and with his background in fine art, Adrian designed sets for Irving Berlin in New York before moving to Hollywood in 1924 after Natacha Rambova recruited him as costume designer for The Hooded Falcon. After that fell through, he made his first screen credit with Her Sister from Paris (1925), and subsequently hired by MGM, where he amasses over 200 film credits over 20 years at the studio. The Women was one of those films. Schiaparelli’s trademark flair for avant-garde couture, the surreal, and the unexpected are noticeable throughout Adrian’s creations, a perfect fit for a film where even the most elaborate item feels necessary and in-keeping with each character. In one scene Rosalind Russell, as snooping Sylvia, removes her coat to reveal a blouse embellished with three eyes. This prompts Florence Nash’s Nancy to retort, “Great guns, what are you made up for, the Seeing Eye?” The eye is one of the most prominent Surrealist motifs, and in this moment, Adrian manages to reference not only Schiaparelli’s eye brooch (made in collaboration with Cocteau), but work by her collaborator Salvador Dalí, including an eye brooch Dalí designed, and the eye-cutting sequence in 1929’s Un Chien Andalou (directed by Luis Buñuel and Dalí). In 1945, Dalí would create an eye-laden dream sequence for Hitchcock’s Spellbound. Yet it is in one particular scene that we see the full force of the Schiaparelli effect: a fantastical moment of otherworldly transportation. The result is a six-minute colour sequence (its inclusion much detested by Cukor himself) titled ‘The Art of the Future’. Set in a department store to showcase the summer collection for sale, it emphasises Adrian’s talent for evening gowns while elevating the Surrealist references within so many of his garments. Couture thrives on a stage, and the use of colour in this instance is not unlike that in The Wizard of Oz, another film by the studio that same year with, you may say, unconscious leanings. Schiaparelli had that rare gift of making the surreal wearable, functional, and fashionable. When Adrian referenced her in The Women, she wasn’t a footnote: she became another cast member. Azzedine Alaïa Collectionneur, Adrian et Alaïa: L’art du Tailleur runs until June 23, 2019, at 18 rue de la Verrerie, Paris.